Joseph: Who is Dave Arnold? Dave: My name is Dave. I am a writer, speaker, minister of the gospel, husband and father. I have been in full-time ministry since 1998 in a variety of roles and have been writing since 2003. Joseph: What’s your redemption story? Dave: I didn’t grow up in the church or in any spiritual background. My grandparents were devout Catholics, so I owe them for at least introducing me to spiritual things as a young boy. However, my life started to spiral down after my parents divorced. But a friend of mine reached out to me and invited me to Young Life, a Christian group in our school. After resisting a number of times, I finally “gave in” and went. And I loved it! What I had been looking for all my life – a place to belong, acceptance and love – is what I found in this group. They didn’t try to change me. They simply cared. After about three months, I was convinced God loved me and I gave my heart to Him. My life radically changed! I went to a Christian College where I learned the Bible and accepted my call to ministry. Joseph: We’ve been online friends and writing partners for sometime and you recently shared on my blog about how you discovered purpose. How did that experience change your life? Dave: I am a huge advocate of purpose! Growing up, I searched for meaning to life. As a result of my testimony, I am passionate about helping people discover they belong to Christ and His family. It’s sad, really, how many Christians don’t believe they have a purpose and hence miss out on living a full life. I hope to be a “voice” to help change that. Joseph: You have a passion for refugees and are a strong advocate for the displaced. What does “Displaced” mean and how can we experience it personally. Dave: To be displaced means to be out of your natural environment. Oftentimes, refugees are literally pushed out of their homeland. But displacement can mean more than that. It’s when you feel like you don’t fit in, or you’re rejected or have lost your purpose. Everyone is looking to belong; and when we don’t belong to God, displacement turns to hopelessness. But here’s the truth: God is at work in displacement. If you look through the Bible (and through church history) you see God working the most in people’s lives when they suffer, feel broken, rejected, or alone. Why? Because it’s when we cling to God and say, “God, I can’t make my life work. I surrender. I need you,” that we grow and God’s purposes become activated in our lives. Joseph: As a writer, speaker, family man and advocate, how do you find a balance? Dave: Great question. Honestly, it can be hard. But I am intentional about structuring my schedule so that I have time for my relationship with God (most important!) and my relationship with my family. I don’t have a 9-to-5, and don’t have to go to an office, which makes it easier to be with my family. But I still I’m out on speaking engagements often, so I have to continually balance my time. Joseph: You have just released your first “Pilgrims of the Alley” this week. What was the motivation for that title? It was while I was working with World Relief, a refugee organization on Chicago’s north side. I was loading up our cargo van with donated furniture for needy families, and met a homeless couple in the back alley. They were searching for something… and the thought “pilgrims of the alley” came to me. As a result, I began to think about how following Jesus in our world is like trying to navigate our faith in the alleys of life – moving forward, seeking to survive, and keeping hope alive. And I wholeheartedly believe that God works powerfully when we are displaced – out of our comfort zones, facing challenges, etc. Thus, we are pilgrims of the alley. Joseph: I’m on your book launch team and I know you are giving away some awesome bonuses this week. How can my readers get access to them? 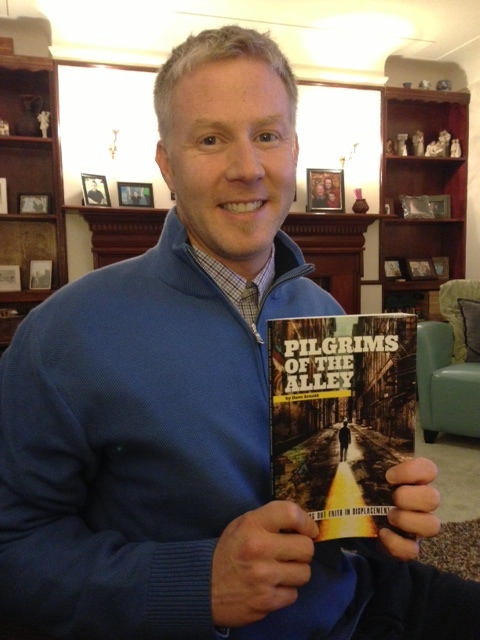 Electronic (PDF) copy of Pilgrims of the Alley. Your name will also be entered into a few contests to win Starbucks cards, free eBooks, and a free hard copy book by Moody Press that I was featured in. To be eligible, please email me your order receipt. You can email me at davejarnold16@gmail.com. This offer is only available until midnight of February 24. I would like to thank Dave for this interview. Get a copy of his book today! What book(s) are you currently reading and would you recommend?